Overnight there was a second set of leaks detected in the BOP assembly sitting on top of the Deepwater well in the Gulf, however these were successfully stopped by Tuesday morning and the flow testing of the well began. Oil was pumped into the well at several different rates, starting at 1 barrel/minute and ending at 7 bpm. During this series of tests the pressure in the well was monitored, and the results were sufficiently satisfying – “Textbook”, as Kent Wells noted, that the well is now in process of being killed as mud is fed into the well at a slow, but steady rate. Admiral Allen described the plan, before the testing began on Tuesday morning. Somewhere at the bottom of the well oil has been flowing into the well, and before it was capped, out into the Gulf. To fill the well with mud, the oil that is in the well has to be pushed back through the flow passage into the rock it came from. There are some different flow dynamics involved in the flow back down the well, but given that the well has been flowing at rates of more than 20 barrels a minute, there was little reason to doubt that the flow could be reversed, as it was. Increasing the flow up to 7 bpm allowed the engineers to monitor the increase in pressure that was required as the flow rate increased. The increase comes both from the higher resistance to flow as the oil moves down the tubular passageways to the bottom of the well, and in the increased resistance as the oil/natural gas Is forced back into the narrower passages in the rock itself. UPDATE: Early on Wednesday BP issued a press release, announcing that the well has reached a static balance. In other words the weight of the mud injected has countered the pressure of the oil in the reservoir rock, so that there is no longer a pressure differential driving oil into the well. The process took 8 hours - less than was expected. The equipment has been fitted with pressure transducers to measure the pressure at different points along the flow (though none beyond the BOP at the top of the casing). Admiral Allen described how this occurs. We have three different sites where we're going to be taking pressure readings. And those pressure readings will be transferred every 12 to 15 seconds by wireless modem to their ROVs that are down there. And they'll be transmitted up into the control room here in Houston and be monitored continuously. In addition we have what we would call an analog or a traditional dial-type pressure meter. And an LED readout that the ROVs will actually have a camera on and be looking at. So there are potentially five different pressure gages we will be reading to monitor the pressure. And in the conclusion of several hours of doing that we will have a profile of how the mud will flow, how the well will react to the volume, and what kind of pressures we can expect to be generated. And then there will be curves established for if – we're filling the mud just into the casing, or the casing in the annulus. How we can expect how much mud will needed because there is more of this wider diameter, and the type of pressures we can expect based on that diameter and that volume. And then we will track the actual mud as it goes in during the static kill against those pressure versus volume lines. (Edited to note that the instrument is a Light Emitting Diode (LED) display and that the vehicles are Remotely Operated Vehicles (ROV) and not as transcribed). The tests were successful, and Kent Wells reported on the success of the oil injection at 3:30 pm. BP also put out a press release, noting that they were beginning to inject mud into the well. Based on the results of the injectivity test, BP started pumping drilling mud today at 21:00 (UK) and 15:00 (CDT) as part of the static kill operations. All operations are being carried out with the guidance and approval of the National Incident Commander. The aim of these procedures is to assist with the strategy to kill and isolate the well, and will complement the upcoming relief well operation. At this start of the injection it is not clear which paths the mud will flow down the well, but as Admiral Allen noted, by the time that 200 – 300 barrels have been injected, then the changing pressure in the well will tell where that mud is going. As I noted yesterday, the reason for this is in two parts. 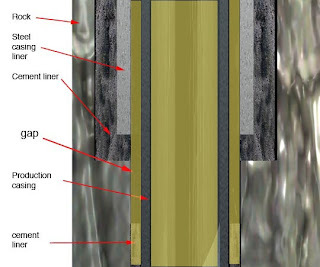 Firstly the oil flow has established a flow path from the reservoir up to the BOP, and outside of that flow channels where the oil is not flowing will remain full of oil, but largely unable to accept the mud as it is injected into the well (because fluid can’t be injected into a passage if there is no way for the fluid already there to escape). So the mud will push the oil back down the flow channel. But at the start of the process no-one knows if that channel included flow down through the production casing, flow down through the annulus around the production casing, or both. Section through the well showing with the light yellow color the channels that the oil might flow through up the well, and which will be filled with mud. Had the well integrity remained as it was planned, there would only be oil (the light yellow) in the center of the production casing after the well was brought into production by firing small shaped charges through the cement at the bottom of the well. There should be no oil in the outer annulus between the production casing and the rock. Obviously oil has been flowing up one or the other, or both, but no-one is sure which is the case. However when the mud is added, then it will only flow down the well back along the path that the oil was taking. This will thus help tell which channel is being filled with mud. 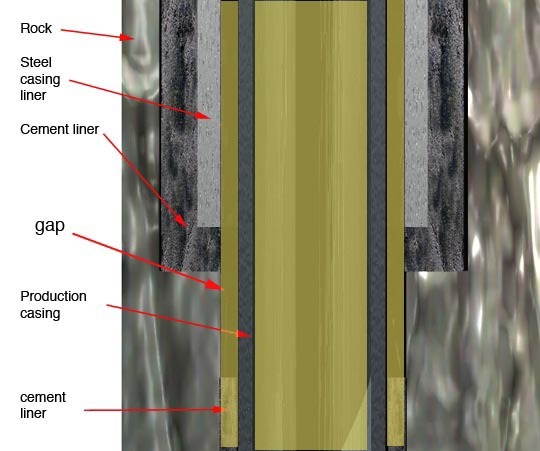 As a given amount of mud is introduced, then the weight of the column of mud will lower the pressure at the top of the well necessary to keep injecting the mud. (Which is sensibly the pressure in the reservoir less the weight of the section of the column which is oil and that which is mud). For a given volume of mud injected, knowing the length of the mud column from the change in the pressure value at the top of the well, it is relatively easy, knowing the cross sectional areas of the three options, to establish which of the channels the mud is flowing down through. The mud is being injected relatively slowly, at about 2 bpm, but the channels are not that large so that within a few hours (in fact they should already know before I post this piece) they will know which path the oil is flowing through, and therefore where the leak at the bottom of the well is likely located. This will then help in the planning of the relief well. For although the injection of the mud should kill the well, so that there will be no flow into the Gulf, it will only be when then bottom of the well (and ultimately the top) are sealed with cement plugs that the well will be considered dead. Admiral Allen wants that to be clearly understood. The Static Kill will increase the probability that the relief well will work. But the whole thing will not be done until the relief well is completed. The Static Kill is not the end all be all. It is a diagnostic test that will tell us a lot about the integrity of the casing. And the wellbore will tell us about the tolerance for volume and pressure. But in the long run, drilling into the annulus and into the casing pipe from below, filling that with mud and then filling that with cement is the only solution to the end of this. And that, Hurricane Colin and other tropical depressions behaving, should be in the next couple of weeks.